St Catherine’s Lighthouse was built in 1838 after the uncompleted lighthouse on St Catherine’s Down (the Mustard Pot) was abandoned. When first operational, the tower was 120 feet high above ground level, this was reduced by 43 feet in 1875 to avoid problems with mist and low cloud obscuring the light. The range of buildings associated with St Catherine’s lighthouse included houses etc for the Lighthouse keepers and their families. The tower was lit by oil lamps until 1887/8 when it was converted to electric with its own generator. 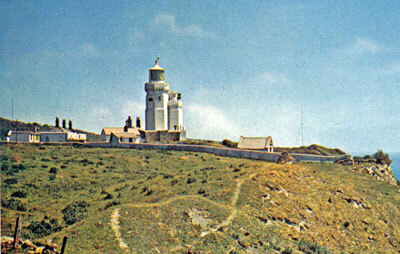 The fog signal engines were originally housed in a separate building near the cliff edge; in 1932 they were relocated to a new building adjacent to the lighthouse tower. During WW2, on 1 June 1943, the lighthouse suffered an aerial attack in which 3 keepers died, a memorial plaque is located on the ground floor of the main tower. In 1997 the operation of the lighthouse was automated and is now unmanned, it is now controlled and monitored from the Trinity House Centre at Harwich, Essex. The Lighthouse is now open to the public at certain times. The Lighthouse Keeper’s accommodations are now rented out as summer holiday lets.